On Sunday, March 5, Kodak joins forces with the Alamo Drafthouse chain (and many other movie theatres around the country) to celebrate Reel Film Day. This new event confirms Kodak’s commitment to 35mm film as an exhibition (as well as preservation) format, and the partner venues are screening a number of classic and lesser-known films on reels of film in solidarity and celebration. Additionally, funds raised from Reel Film Day screenings will support a new preservation project by Martin Scorsese’s Film Foundation. where these exciting projects are guided by Margaret Bodde. That Reel Film Day should be observed and celebrated in San Francisco is no surprise, as San Francisco is notable for the number of 35mm film venues still operating in the Bay Area. San Francisco’s Alamo Drafthouse is the newest venue on that list, and since its splashy opening in December 2015 in the New Mission Theater it has maintained a robust 35mm repertory film schedule alongside its digital screenings of current releases. Under the stewardship of programmer Mike Keegan (an enthusiastic longtime presence on San Francisco’s rep scene, whose experience includes a long stint programming for the Roxie Cinema), the Alamo’s 35mm offerings include popular weekly late-night offerings such as Terror Tuesday and Weird Wednesday. Keegan took a few minutes to speak to me about the challenges and rewards of 35mm programming at his venue, and to shed some light on his gloriously left-field choice for Reel Film Day: Jean-Luc Godard’s little-seen and powerfully offbeat King Lear, a Shakespeare adaptation quite some distance from the Globe Theatre. Info about the screening of King Lear. David Robson for EatDrinkFilms: What do you think audiences get from 35mm film screenings that they don’t get elsewhere? Mike Keegan: Nick Pinkerton wrote a piece in Artforum a few years ago that nails this far better than I will, but to paraphrase: this is the twilight of the dominant way people experienced story telling for a century. Every time you get a chance to see a print, it very well might be the last time that print is played. In that sense, attending a 35mm film screening is closer to going to a live performance than it is watching Hulu+ in your underwear. EDF: Are there any particular triumphs of 35mm film programming from your first year at the Alamo that stand out? MK: Oh man, so much! The griminess of Poor Pretty Eddie’s battered print making the subject matter even more lurid and tragic. Getting an imported print and really nice crowd for a rainy Sunday evening screening of The Mother and the Whore. The shockingly perfect condition of a private collector’s print of Suspiria blowing minds in a full-capacity Terror Tuesday, and one month later the same crowd going totally insane at the final shot of Sleepaway Camp. And playing the newly-struck print of Alex Ross Perry’s Queen of Earth was an honor. There were a lot of things, it’s really hard to pick a handful! EDF: You’re now well into your second year at the Alamo, and your mid-week, mostly 35mm series are established features on San Francisco’s rep landscape. What challenges are you facing next, either within or beyond these programs? Mike Keegan: A year and change into the weeknight series, I feel more excited than ever. It’s great to see what works, what doesn’t, what people want to see and where you think you can get away with pushing people’s boundaries. For example, in the next few months we’re screening Claire Denis’ Trouble Every Day for Terror Tuesday (3/21) and the insane Martin Short movie Clifford on a Weird Wednesday. Those are pretty far afield from 80s party horror and 70s exploitation – Terror Tuesday and Weird Wednesday’s respective North Stars – but they push the same buttons of aesthetic terrorism and monomaniacal dedication to vision. EDF: Can you speak to the Alamo’s goals for Reel Film Day? What would you, as a programmer or a man of cinema, like to see result from the activity on March 5th? MK: People get sorta twisted about – let’s call them nu-holidays – but they’re fun. Speaking for just me (not the Alamo as a whole), this is basically a fun slot to show something perverse that only exists in that format. And sure, 99.9999999997% of film history does not exist in a good digital form, but I have a lot of specific outlets to put certain stuff on screen. Besides the aforementioned Terror Tuesday and Weird Wednesday, I try to get 35mm on Music Monday as much as possible, as well as monthly series like Cherry Bomb and Girlie Night (which half of the time is 35mm! ), not to mention the other sundry series I try to pull off. So I’m super lucky I have these baskets to put all kinds of movies in. When I have an extra slot open up like Reel Film Day, my inclination is to go with something special that would otherwise be hard to slot into my regular calendar. EDF: Has Kodak been hands-on with their participation in the event? MK: Yeah, they’ve been great! They’ve been slowly rolling out this great resource called Reel Film, which is an app that tracks 35mm screenings all across the country. Is your car broken down in Dubuque? Got a day to kill? Fire up the app, maybe Satantango is playing down the street! EDF: We live in hope! Even amid the diversity of RFD offerings at Alamo Drafthouses around the country (which include Welles’ Touch of Evil, Demme’s The Silence of the Lambs, De Sica’s Bicycle Thieves, and Russell’s The Devils), Godard’s King Lear is a standout, even perverse, choice. I adore the movie, but am curious why you selected it for this event. First off, we’re lucky to live in an area with a really vibrant rep film scene. The Castro, Yerba Buena Center for the Arts, Pacific Film Archive, the Roxie, the Balboa, the Stanford – a lot of ground gets covered on a weekly basis! So while some accidental overlap of titles in inevitable, I wasn’t thrilled by the prospect of just throwing on some canonical classic. That’s definitely a luxury of being in San Francisco. So the Cannon Film Group under Golan and Globus…they’re such a weird explosion of ambition. Immediately when I think of Cannon Films, I think of things like Chuck Norris and airbrushed posters, Albert Pyun’s can-do attitude, Dolph Lundgren’s oiled-up performance in Masters of the Universe (a movie that plays like a hustling cokehead describing what he thinks happens in Star Wars without ever having seen it). But on the other hand, Cannon put out John Cassavettes’ Love Streams! They put out Andrei Konchalovsky’s Runaway Train! It feels like what they wanted out of Godard was a middlebrow prestige picture, which is baffling if they had ever actually, you know, watched a Jean-Luc Godard movie. But they made this insane and insanely public deal for him, and on paper it sounds like they’re gonna get a traditional movie. The cast is nuts:, Woody Allen, Julie Delpy, Burgess Meredith, Molly Ringwald, Norman Mailer, Peter Sellars (the stage director, not the comedian) to name a few. That must have seemed commercial back at Cannon HQ. I have a soft spot for Godard’s post-60s stuff, which I know isn’t for everyone, but there are a lot of gems. Specifically mid-80s onwards: Hail Mary would be most directors’ best film, for instance. And the recent Goodbye to Language uses 3D in a way people one quarter of his age wouldn’t even imagine. In the end, King Lear is a movie about the impossibility of adaptation and the ridiculousness of artistic and commercial compromise. In many ways, that makes it the perfect movie for this event. Or, more simply, we can just use the tag from the front of blurbs in those halcyon days of the ‘00s: NOT ON DVD! EDF: It’s great that Tom Luddy, who produced the film, co-wrote the screenplay, and even features in the movie as a voice-over, will be present at the King Lear screening. How did that come about? MK: Tom helped put on the great premiere of The Wanderers restoration with Philip Kaufman we did back in November. We got talking about King Lear, and it just kind of stuck a post-in note in my brain. I’m really happy he’s able to come out and talk about it! 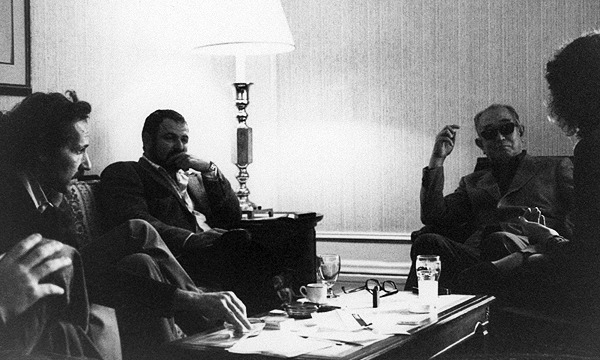 Tom Luddy with Werner Herzog, Jean-Luc Godard, and John Milius meeting with Akira Kurosawa (see below) at the Plaza Hotel in 1980. EDF: Anything you want to add to wrap this up? MK: I would like to give a grateful shout out to Chris Chouinard at Park Circus. Park Circus handles the film libraries of tons of defunct and active studios and distributors, and that dude will dig deep to provide good prints. At this point in the rep game, it’s standard operating procedure to clear the rights for a movie from one place and then source a print from a private collector or archive. You couldn’t ask for a better one-stop shop than Park Circus. And I would be remiss not to mention: one of my Top 3 shows we’ve ever done at New Mission was showing Rivette’s OUT 1 from a DCP (Digital Cinema Package) to a sold-out micro (34 seats) one sunny Saturday in April last year. I could only get away with something as audacious as that because I could sell exactly 34 tickets to this thing, and it’s nice to have to flexibility of bringing in a single hard drive to a small room rather than like 39 reels of film. That said, 13 hour Jacques Rivette films are the outliers. Enthusiastic film screenings are the best things on the planet, no matter the format – come on out! Mike Keegan is the Creative Manager of the Alamo Drafthouse at the New Mission. He books the movies, hosts screenings and generally chatting with audiences, both online and in the theater. Previously he booked movie theaters (including The Roxie), film festivals and, in his words, “some ill-considered parties all around the Bay Area and beyond.” Outside of movies, he worked as a ticket-taker in a zoo and in the coat check of a goth club. Read Michael Guillén’s terrific interview with Keegan and Alamo founder (and serious film collector) Tim League on The Evening Class. David Robson is the Film/Video Curatorial Assistant at Yerba Buena Center for the Arts in San Francisco, working with Joel Shepard. He is a Passionate devotee of art, culture, and “The Word.” He has put that passion to work for various companies, from providing marketing copy/descriptions for dozens of downloadable films at the movie discovery engine Jaman.com to shaping the mission of a museum artist-in-residence program. He writes (mostly) about horror and fantasy movies on his blog The House of Sparrows.